Lunar Eclipse Chandra Grahan Blood Moon 2018 Live Updates: People in India and other countries will be able to witnesses one of the rarest celestial phenomenon a total lunar eclipse starting from late night on July 27 night and continuing till early morning. 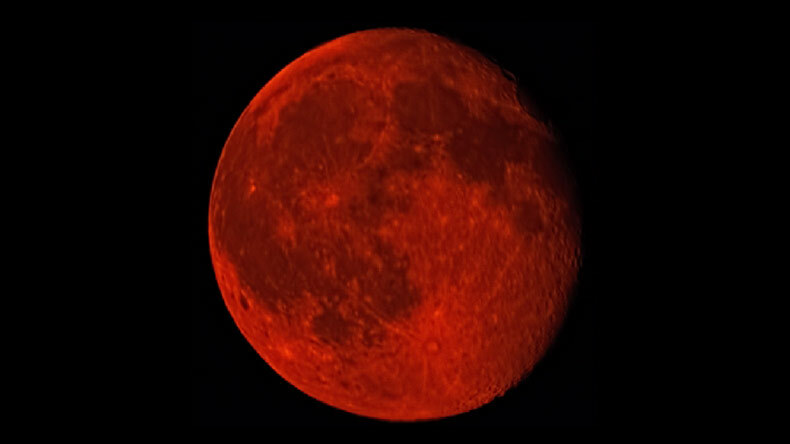 In this celestial phenomenon, the moon will turn extreme red or blood red. In one of lifetime experience, people will be able to witness the longest total lunar eclipse of the century taking place on July 27 (tonight). The total lunar eclipse will remain active till early hours of July 28. It is going to be one of a lifetime experience when people will be able to witness the moon turning bright red which is also being referred to as the blood red moon. According to experts, the total lunar eclipse will be active for close to 1 hour 45 minutes. The lunar eclipse will start at around 10:45 pm on July 27 (tonight). This rarest phenomenon will be visible in India also. 3:00 AM: The Blood Moon Eclipse has ended. Thanks for being with us for the century’s longest lunar eclipse. 2:45 AM: As the red Moon has completed the Umbra stage of the lunar eclipse, the colour has now slowly started to change from Red to Orange. Now, the Full Eclipse has ended and the Partial eclipse stage begins. 2:30 AM: Priscila Sinaga captured the moon’s reddish hue during the blood moon eclipse in Cinere, Indonesia. 2:25 AM: For those who don’t know why lunar eclipse doesn’t occur every month despite moon revolving around the earth, the simple reason is that the moon is not always in perfect alignment with the sun and the Earth. 2:20 AM: In India there are a number of superstitions associated with lunar eclipse, and to dispel myths surrounding eating habits during the lunar eclipse, astronomers urged Indians to upload selfies with the hashtag #EclipseEating while enjoying food during the longest lunar eclipse. 2:08 AM: Delhiites may face some disappointment, as the moon is not visible due to cloudy weather. But pictures have started pouring in from around the world, this latest picture is from Dubai. 2:00 AM: For those skywatchers who are still unaware of the fact that the Moon is at apogee, and what this apogee is, here is the explainer, apogee is the farthest point on its orbit. “For lunar observers on Earth, this will appear to be the smallest full Moon of the year,” as per NASA. 1:55 AM: The Moon is at its maximum eclipse on 28 July at and appears blood Red. The total eclipse will end on 28 July in India at 02:43:11 (IST). Following this, the partial lunar eclipse will end on 28 July in India at 03:49:00 (IST). 1:50 AM: Amid cloudy night in India, skywatchers have begun to catch glimpse of blood moon lunar eclipse, that is the longest of this century. 1:45 AM: Now that the total eclipse is being seen around the world, it still has more than 60 minutes to go. 1:35 AM: Did you know, with some astrologers making dire predictions for those in power, Indian politicians were left in a tizzy. Former Prime Minister HD Deve Goda left for Triupati to offer prayers. 1:25 AM: Skygazers witnessing Blood Moon have started tweeting the pictures of the red moon, have a look. 1:20 AM: Did you know that this Moon is called the Sturgeon, Hay, or Mead Moon. In India and Nepal, tonight’s Moon marks the festival of Guru Purnima, celebrating spiritual teachers. 1:15 AM: NASA has tweeted a video to explain the spectacle that’s won’t repeat itself in the coming couple of centuries. Have a look. 1:10 am: “It’s called a blood moon because the light from the sun goes through the earth’s atmosphere on its way to the moon and the earth’s atmosphere turns it red in the same way that when the sun goes down it goes red,” Andrew Fabian, professor of astronomy at the University of Cambridge was quoted as saying by Reuters. 1:00 am: Visuals of lunar eclipse have started coming in from all over India. 12:50 am: As per experts’ calculation, due to this blood moon, earth will see a continent shift and there will be 9 continents around 2072. 12:25 am: Moon will turn red only at the highest point of the total lunar eclipse, which starts around 1 am, on the night of July 28. The spectacle will be visible from naked eyes, unlike the solar eclipse there is no need to cover the eyes. 11: 35 pm: This event can be seen by people across Eastern Africa, Australia, Asia, parts of South America and Europe. It won’t be visible in the United States though NASA has a stellar link to the whole thing. 11:20 pm: Like Goa DGP Dr Muktesh Chander said, the lunar eclipse is a visual feast. Unlike the ultra-violet- or infra-red-heavy solar eclipse, one needn’t worry about what the moon may do to one’s eye. The moon, last checked, will not damage one’s eyes during an eclipse. 11:10 pm: Most public personalities haven’t commented on the full-on sale of superstition and astrology in TV studios to capitalise on viewership. Barring the Goa DGP Dr Muktesh Chander, hope the powers-that-be don’t take offence in the sunny state. 11:00 pm: The penumbral eclipse began some 20 minutes ago and, in another 40 minutes, the partial eclipse should also begin. The total eclipse should begin shortly after 1 am. The whole eclipse will end at 2.43 am. 10:50 pm: But what makes this whole thing exciting is there are going to be two red glowing orbs. One will be the aforementioned Red Moon and the other will be the Red Planet, Mars. The Red Planet will be its brightest tonight. Well, even if you don’t support or like the communists, it’s the night of Reds. 10:45 pm: Unlike the much celebrated Pink Floyd album, The Dark Side of the Moon, this eclipse will not be like all dark. It is a sight to enjoy and savour without the “dark” grip of superstition and fatalism (fingers crossed). 10:40 pm: Unlike fears that the monsoon clouds may block out the spectacle, it is expected that the moon will be visible on the horizon since the cloud cover is said to be dwindling. This spectacle is a must watch for those who believe that such an event, and the longest in the century, should not be missed. 10:35 pm: Though this picturesque celestial phenomenon will be visible at different times in different countries, people will be able to witness Moon in different shades of colour till it finally becomes blood red. However, due to monsoon days in India, especially in North Indian states including Delhi-NCR, Uttar Pradesh, Himachal Pradesh and other regions, people may not be able to witness this once in a lifetime phenomenon. 10:30 pm: The lunar eclipse, said to be the longest in the century, will begin with a partial one beginning at 10.45 pm or so but the total eclipse will kick in an hour post-midnight at 1 am and last for an hour and forty-three minutes till 2.43 am into the morning of Saturday, July 28. 10:25 pm: A lunar eclipse is met with great fear and trepidation in all ancient civilisations. This is possible because one of the two sources of light known to human-kind disappears during this spectacle. This possibly must have set out several million superstitions among people who follow a lunar calendar like we do in India and elsewhere. 10:20 pm: One can wonder that once some object blocks another, the colour will turn black but the Red Moon will come about since the atmosphere of good old planet earth will only refract the red range of colours of the VIBGYOR range. 10:18 pm: Here’s why this will be the Red Moon: The colour of the moon is usually white since it reflects the sun’s light but during an eclipse, the moon turns red because the earth comes between the sun and the moon. 10:10 pm: Apart from India, this rare celestial and picturesque phenomenon will also be visible in other parts of the world including South-America, parts of Europe, Africa, Asia, Australia. Meanwhile, in Asian countries including India and countries in Eastern Africa can use this opportunity to witness this interesting, picturesque celestial event. 10:00 pm: In this rare phenomenon, the Sun, planet, moon and planet Mars will fall into a rare alignment creating a total lunar eclipse due to which our Moon will turn blood red.